The paper explores the agricultural potential of the municipality for Lajkovac and accordingly defnes the development priorities and strategic measures of sustainable development in this area. The purpose of the research is to examine the real possibilities for the development of agriculture and rural areas of the Municipality. Consequently, the analysis focuses on: the structure of the economy of the Municipality, the importance and role of agriculture and agro-industry in the municipal economy and the development priorities and strategic measures in the agriculture of the municipality. The research’s results show that the Municipality of Lajkovac has favorable factor conditions for the development of agriculture. With regard to the development of Lajkovac agriculture in the coming period, it will be important to develop the processing sector, that is, capacity building, especially in the small and medium enterprises in agriculture (SMEA) sector, in the feld of processing meat, milk, fruit and vegetables. 1. Analysis of agriculture and food industry of Serbia in 2015, Association for Agriculture, Food Industry, Forestry and Water Management, Chamber of Commerce of Serbia (SCC), Belgrade, March 2016. [in Serbian: Analiza poljoprivrede i prehrambene industrije Srbije u 2015. godini, Udruženje za poljoprivredu, prehrambenu industriju, šumarstvo i vodoprivredu, Privredna komora Srbije (PKS), Beograd, mart 2016]. 2. Dobson, A. (1996). Environment Sustainabilities: An Analysis and a Typology, Environmental Politics, 5(3), 401-428. 3. Đuričin, D. (2006). Transition, stabilization and sustainable development: Perspective of Serbia, Introductory paper. Miločer Economic Forum 2006: European Priorities and Regional Cooperation, Association of Economists of Serbia, Miločer. [in Serbian: Đuričin, D. (2006), Tranzicija, stabilizacija I održivi razvoj: Perspektiva Srbije]. 4. Economic Accounts of Agriculture in the Republic of Serbia 2007-2014, Statistical Offce of the Republic of Serbia, Belgrade, 2015. [in Serbian: Ekonomski računi poljoprivrede u Republici Srbiji 2007-2014, Republički zavod za statistiku, Beograd, 2015]. 5. Elkington, J. (1998). Cannibals with forks: The triple bottom line of 21st century business,Gabriola Island, BC Canada: New Society Publishers. 6. Report on Strategic Environmental Assessment, Detailed Regulation Plan, Industrial Zone 2, Lajkovac Municipality, 2014. [in Serbian: Izveštaj o strateškoj proceni uticaja na životnu sredinu, Plana detaljne regulacije, Industrijska zona 2, opština Lajkovac, 2014]. 7. Report from the focus group meeting in the premises of the municipality of Lajkovac, Department of Economy and Property Legal Affairs, Lajkovac, July 12, 2016. [in Serbian: Izveštaj sa sastanka fokus grupe u prostorijama opštine Lajkovac, Odeljenje za privredu I imovinsko pravne poslove, Lajkovac, 12.07.2016]. 9. Nikolić, R., Fedajev, A., Stefanović, V., Ilić, S. (2017). Agriculture Sector in the Western Balkan Countries during the Transition Period. Economics of Agriculture (64) 1, 293-306. 10. Agriculture Census 2012, Volume 1, Statistical Offce of the Republic of Serbia, Belgrade, 2014. [in Serbian: Popis poljoprivrede 2012, Knjiga 1, Republički zavod za statistiku, Beograd, 2014]. 11. Census of Population, Households and Dwellings in the Republic of Serbia, 2011, Economically Active Population Occupied by Activity, Age and Gender, by Municipalities / Towns, Statistical Offce of the Republic of Serbia, Belgrade, 2011. [in Serbian: Popis stanovništva, domaćinstava i stanova u Republici Srbiji, 2011, Ekonomski aktivno stanovništvo koje obavlja zanimanje prema delatnosti, starosti i polu, po opštinama/gradovima, Republički zavod za statistiku, Beograd, 2011]. 12. Program of support measures for implementation of agricultural policy and rural development policy for the municipality of Lajkovac in 2016, Lajkovac, 2016. [in Serbian: Program mera podrške za sprovođenje poljoprivredne politike i politike ruralnog razvoja za opštinu Lajkovac u 2016. godini, Lajkovac, 2016]. 13. Simonović, Z., Jelocnik, M.,Vasić, Z. (2012). Economic Position of Serbian Agriculture in the Period Transition, Economics of Agriculture, Belgrade, No. 3/2012, 535-544. 14. Statistical Yearbook of the Republic of Serbia, Statistical Offce of the Republic of Serbia, Belgrade, 2015. [in Serbian: Statistički godišnjak Republike Srbije, Republički zavod za statistiku, Beograd, 2015]. 15. Strategy for Local Sustainable Development of the Municipality of Lajkovac for the period 2015-2025, Municipality of Lajkovac, Valjevo, 2015. [in Serbian: Strategija lokalnog održivog razvoja opštine Lajkovac za period 2015–2025, opština Lajkovac, Valjevo, 2015]. 16. 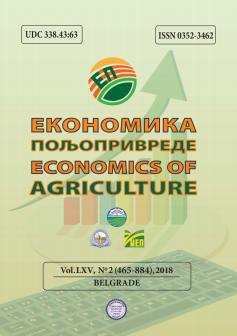 Strategy for the Development of Agriculture and Rural Development of Lajkovac in the period 2011 - 2015, Institute for Agricultural Economics, Belgrade, July 2011. [in Serbian: Strategija razvoja poljoprivrede i ruralnog razvoja Lajkovca u periodu 2011. – 2015. godine, Institut za ekonomiku poljoprivrede, Beograd, jul 2011]. 17. Vasiljević, Z., Zarić, V., Zakić, V. (2011). Basic strategic determinations of the development of agriculture and villages in Serbia until 2020, Ekonomski vidici, 2011, vol. 16, (2) 275-287. [in Serbian: Vasiljević, Z., Zarić, V., Zakić, V. (2011), Osnovna strateška opredeljenja razvoja poljoprivrede i sela u Srbiji do 2020. godine]. 18. Vojinović, Ž., Zelenović, V., Cvijanović, D. (2017). State Support Program in Agriculture Crediting, Economics of Agriculture (64) 1, 339-358. 19. Permanent conference of cities and municipalities [in Serbian: Stalna konferencija gradova i opština] http://skgo.org/municipalities/16/privreda (July 13, 2016). 20. Vindija, http://www.vindija.hr (July 17, 2016). 21. Fruvela, http://www.fruvela.com (July 17, 2016). 22. Iva Agrar Lajkovac, www.iva-agrar.rs (July 17, 2016). 23. Microcontrollers, http://www.mikroe.com (July 17, 2016). 24. Borverk Lajkovac, https://borverk.ls.rs/rs (July 17, 2016). MIHAILOVIĆ, Branko; SIMONOVIĆ, Zoran; BRZAKOVIĆ, Tomislav. STRATEGIC PLANNING OF SUSTAINABLE DEVELOPMENT OF AGRICULTURE OF LAJKOVAC MUNICIPALITY. Economics of Agriculture, [S.l. ], v. 65, n. 2, p. 475-491, june 2018. ISSN 2334-8453. Available at: <http://ea.bg.ac.rs/index.php/EA/article/view/473>. Date accessed: 19 apr. 2019. doi: https://doi.org/10.5937/ekoPolj1802475M.